In addition to actor and producer, James Franco is a prolific director. How will you do it in the science fiction genre, with an additional antagonistic role? This is the trailer for Future World, where he will share credits with Lucy Liu and a lethal Milla Jovovich. The plot of Future World revolves around Prince (Jeffrey Wahlberg), who must travel through a desolate wasteland to find a miraculous medicine that will save the life of his mother (Liu). After evading violent motorcyclists led by an insane (Franco) and his buddy (Cliff Smith), Prince will find the sexual android Ash (Suki Waterhouse), who is in search of his destiny. When Prince is captured by the leader of a drug empire (Jovovich) and the forces of the warlord motorcyclist stalk him, Prince must fight to save the remnants of humanity. 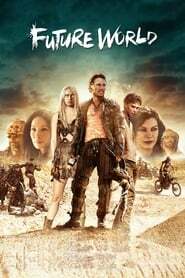 Does it sound like a Mad Max spinoff? Maybe that is the intention (although there is no link). Future World was filmed from 2016, and it seems that the intention was to wait to have a healthy distance from the premiere of Mad Max: Fury Road. The film will premiere on May 25 in select venues in the United States, as well as iTunes and Amazon.